Going public to gain support, especially through reliance on national addresses and the national news media, has been a central tactic for modern presidential public leadership. 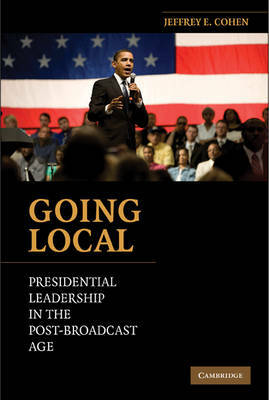 In Going Local: Presidential Leadership in the Post-Broadcast Age, Jeffrey E. Cohen argues that presidents have adapted their going-public activities to reflect the current realities of polarized parties and fragmented media. Going public now entails presidential targeting of their party base, interest groups, and localities. Cohen focuses on localities and offers a theory of presidential news management that is tested using several new data sets, including the first large-scale content analysis of local newspaper coverage of the president. Although the post-broadcast age presents hurdles to presidential leadership, Going Local demonstrates the effectiveness of targeted presidential appeals and provides us with a refined understanding of the nature of presidential leadership.